How much do you earn in comparison to last year? We asked 100 users on freelancermap.com that very questions and the results vary quite a bit. First, the good news – 42% percent of the people who answered, said they are earning more than they did in 2014 so far. We would like to think that we have played our part in that with engaging, profitable projects and our freelancer tips. The main reasons you earned more are clear – your passion, your desire to move forward and your skills are what drives your career and turns you into successful freelancers. 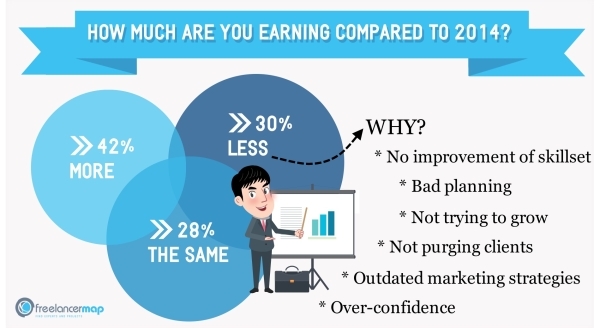 Why are you earning less or the same as last year? Times change and we as freelancers must change with them lest we fade into irrelevance. Think about what your strongest hard skills are – are they highly sought after in your field or have they been replaced by others? Chances are, things have changed up quite a bit. Freelancing means constant improvement. Thinking you’re set with what you know for a while is one of the biggest mistakes you can make. Did you evaluate your strategy from last year, identify your strong and weak spots and plan accordingly for the next? If not, this probably played a part in why your income didn’t go up. Rarely does going in blind work for an entire year. You might have a streak of good luck, but no amount of luck can make up for a lack of planning. And even if you had a clear, concise plan, ask yourself honestly: How well did you follow it? Having a couple of stable and good clients is completely fine, but you shouldn’t let yourself be tied to them for life. Purging clients can be a difficult, but required process for the positive development of your career. Don’t be afraid to cut the weak links and pursue new opportunities. Have you thought about your marketing strategy and the channels you use lately? They might be the reason your profit is staying at the same level or even declining. Putting 4 hours a week into Google+ is not a good idea at this point of time, as it simply doesn’t have as much users as other similar platforms. Where you do your marketing is just as important as how you do it. If you just had a good year behind you, it may be tempting to relax and treat yourself to an extra couple weeks of vacation. And you shouldn’t deny yourself that. However don’t think that success or income, as it were, exponentially grow with little effort – that is far from the truth. The most successful freelancers work equally hard at their worst and best times. The secret? They love what they do. How has your income changed in 2015? Do you recognize yourself in any of the above reasons for stagnation or have other explanations? Drop us a line in the comment section below, we’re always happy to hear from our readers and help them out when we can!